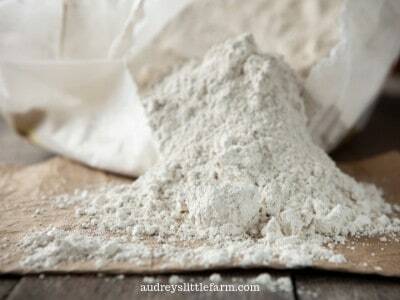 If you’ve never used diatomaceous earth it’s time to start! It has so many great benefits for chickens so continue reading to learn! 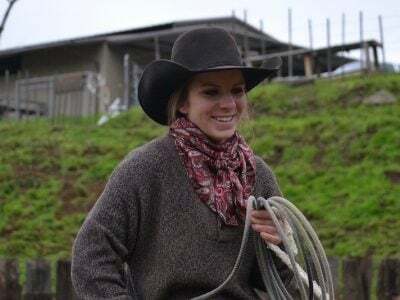 It wasn’t until recently that I learned about diatomaceous earth, but it is now an essential on my farm. I remember getting the book Fresh Eggs Daily by Lisa Steele, and she mentions adding in diatomaceous earth to your chickens dust bathing area. Since that moment, I started my research on diatomaceous earth and I quickly learned that it is a chicken keepers best friend! Diatomaceous earth (DE) is a chalk like powder made up of the fossilized remains of tiny aquatic organisms called diatoms. Their skeletons are made of a natural substance called silica. The various forms of silica include sand, quartz, emerald, mica, clay and glass. Silicon (a component of silica) reacts with oxygen and water to form silicon dioxide. Silicon dioxide then has two naturally occurring forms: crystalline and amorphous. Diatomaceous earth is made up of mostly amorphous silicon dioxide, although it can contain low levels of crystalline silicon dioxide as well. DE has been around hundreds of years, but it has been in more more recent years that all the great benefits of diatomaceous earth were discovered! 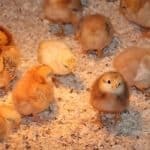 So now that the boring information is out of the way, lets get to why you need diatomaceous earth for your backyard chickens, whether your flock is big or small! It is a great natural way to kill bugs and external parasites that infest your chickens such as mites and lice. There have not been as many studies on the effects of DE controlling internal parasites but it is completely safe for chickens, therefore it cannot hurt anything. Of the studies that have been done it is said that diatomaceous earth is effective in getting rid of internal parasites. Plus the study showed that the laying hens that consumed DE were heavier and laid more eggs. 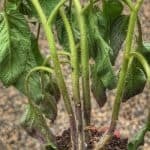 The way that the diatomaceous earth kills the bugs and parasites is by drying them out. The sharp edges of the microscopic silicon particles are abrasive and cause the bodies of the parasites to dry out, blocking their airways, then attacking their respiratory systems… And woo they’re dead! Diatomaceous earth is a perfect addition to your chickens feed because it is completely natural and packed with minerals. It will absorb moisture and eliminate smells so it is a super easy and effective way to control odors around the chicken coop! It’s definitely a great product to incorporate when you’re cleaning your chicken coop! 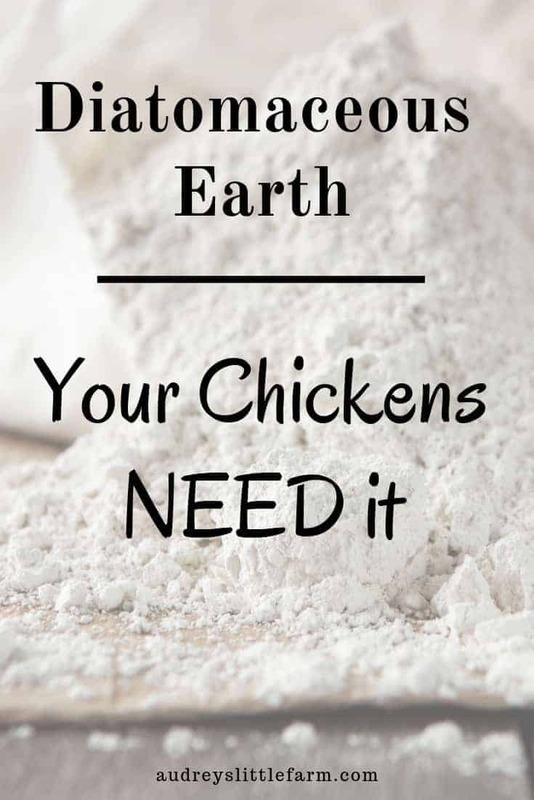 To start off, be sure that you are using food grade diatomaceous earth for your chickens. It is likely that all forms of DE are safe but using food grade DE will guarantee that it is safe for both humans and animals. You should be able to find it at your local feed store, but if not, you can order food grade DE straight from Amazon. So now back to all of the great ways to use DE! It’s great to use in your chickens dust bath. 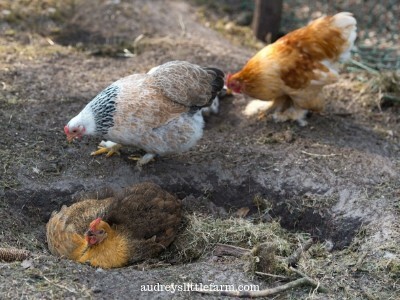 Chickens will naturally fluff themselves in the dirt and I’m sure that if you have chickens already you’ve seen the holes everywhere! It’s pretty much impossible to keep your chickens strictly using the dust bath area. But I do have a specific dust bath area for them. I have an old tractor tire filled with sand, wood ash, and diatomaceous earth. Along with the DE, wood ash is a great natural way to kill parasites. In fact, for years that is all chicken keepers have used! Just be sure when using wood ash that it’s only fireplace ash, no briquettes or ash from treated wood. Another reason why I love adding ash to the chickens dust bath is because of all the extra benefits that it provides. Wood ash contains vitamins K, calcium, and magnesium and charcoal absorbs toxins, removes impurities, and acts as a natural wormer. If you are wondering what the difference between the ash and charcoal is, it is just that ash is the powdery grey remains of burnt wood and charcoal is the black chunks of wood that did not fully turn into ash. It is likely that your chickens will peck at the remaining chunks of charcoal and any little bit they end up eating will be beneficial. Sprinkle DE around the chicken yard and coop. Like I mentioned above, chickens like to fluff everywhere! So to make sure that your chickens fluff in the DE, just sprinkle it everywhere the chickens fluff. While sprinkling it in the coop, you can put it in the nesting boxes, on roosts, on the floor, and anywhere you see your chickens hanging out. In fact, sometimes at night once all of my chickens are roosting I will go into the coop and sprinkle the DE on the backs of all of them. This way, every now and then you can be sure that your chickens have been treated with super bug killer! The third way you can use diatomaceous earth for your chickens is by adding to their feed. I simply just sprinkle a few hand fulls into their feed and mix it around. This way every time they eat they get a little bit. Now that you know all the benefits of using DE for your chickens, make it a staple on your farm! I don’t always put my heart into recommending products but DE is just truly awesome! 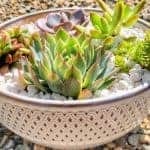 It is a super amazing and effective solution for so many things. So instead of having different products for all your chicken needs, use diatomaceous earth because it’s the cure-all!